Mono’s striking cutwork back of flexible, shaped polypropylene, is responsive to your posture and movement. The punched detailing make this chair breathable and effortlessly cool. 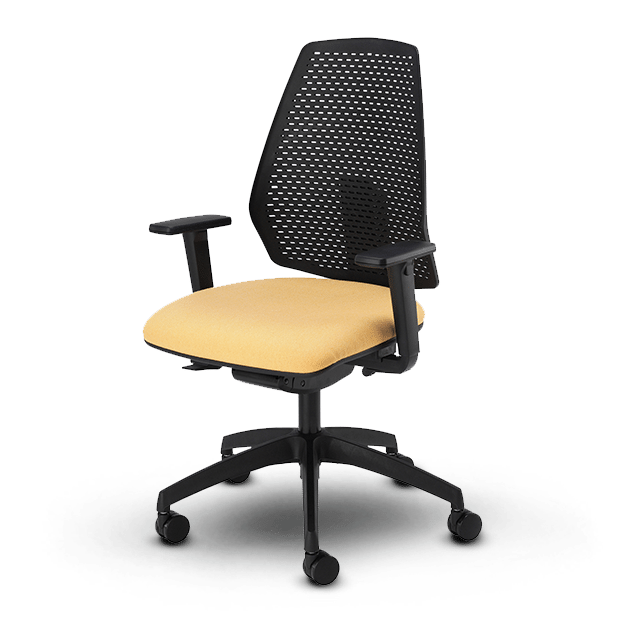 Following your natural shape, the contoured height-adjustable back offers fully supported sitting through a perfectly positioned lumbar curve. Mono comes with ratchet height adjustment as standard. The slim-line, integrated seat slider also helps to position this chair to the user’s exact metrics. Mono features a self-tensioning, body-balance synchro-mechanism with push button, 5-position locking so the back can be left in dynamic free-float mode, which uses the user’s weight to perfectly gauge the tilt-resistance, or it can be locked in 1 of 5 tilt positions. The Anti-shock feature means it won’t catch you by surprise. Coordinating cantilevers are perfect for guests and meetings.